Do you ever wonder whether some blog posts actually turn out the way the person posting says they will? I do as well. 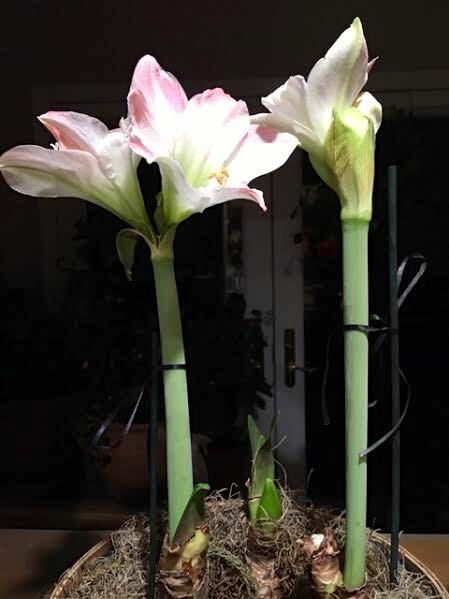 I thought about that as I was doing dishes earlier tonight and enjoying what I call my birthday Amaryllis bulbs, all starting to bloom in a pot in my kitchen. It may be cold and drizzling outside but these lovely flowers are brightening, and warming up, my home. Quick recap. These Amaryllis bulbs were on deep discount after Christmas so I picked up three to add to my other Apple Blossom Amaryllis bulbs. I have a couple of pots full of bulbs that summer outside, then come inside in fall to bloom - well, not quite sure when they will bloom, which is why I splurged on these three as a birthday gift. Amaryllis are native of South America and usually easily found mid-fall through Christmas. They come in a variety of colors and shapes. Two of the more popular ones include the pinkish Apple Blossom and the red ones usually featured during Christmas. As I said in my earlier blog post, you want to pick Amaryllis bulbs already showing a little bud at the tip of the bulb. This is what all three of my Apple Blossom Amaryllis bulbs had when I selected them. The bud is thicker than the leaves that will develop after the flowers. 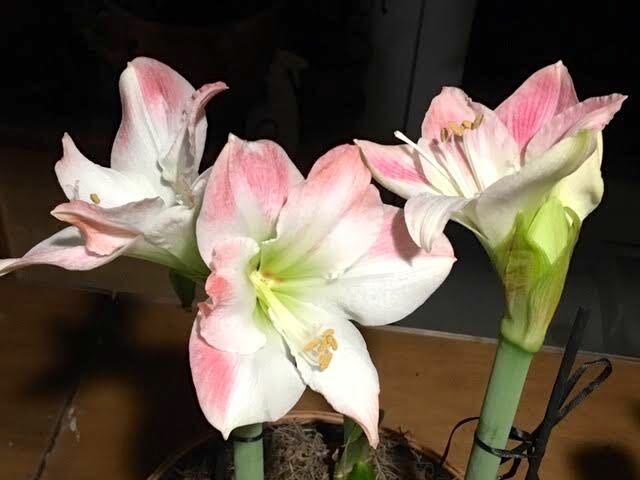 Although most Amaryllis bulbs planted and watered at the same time will grow together, two of the three Apple Blossom Amaryllis bulbs took off once they were in the pot. I tied them up once they were 6 inches tall to make sure the weight of the flowers didn’t make them tip over. At the other end, the Apple Blossom Amaryllis buds had several flowers inside each of the flower buds. These will bloom for a couple of weeks and get replaced by new flowers. The Apple Blossom Amaryllis flowers are keeping my Christmas poinsettia company. I think they nicely brighten up my kitchen sitting next to the poinsettias. Frankly with these flowers as company, I enjoy washing my dishes!